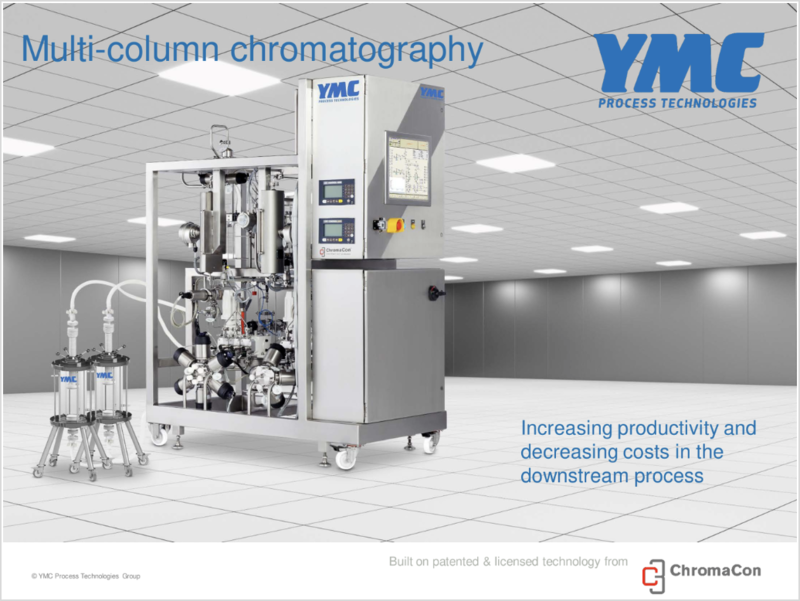 Our multi-column chromatography systems offer significant advantages to those who need to increase capacity (de-bottleneck downstream) or reduce Protein A cost. Our EcoPrime Twin “2C-PCC” solution is built on ChromaCon intelligence and patents and helps you take advantage of the most simple GMP scale multi-column technology. NEWS! YMC has acquired ChromaCon AG as of April 2019 - read the press release and FAQ's here. 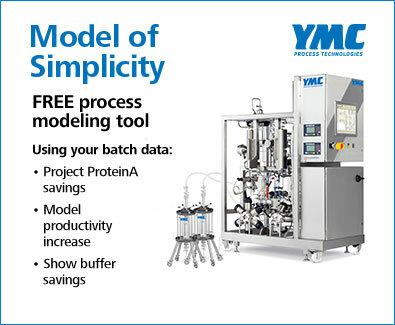 When compared to conventional batch processes, the system delivers enhanced resin capacity utilization (up to 3X), decreased buffer consumption (by over 50% in many cases), and increased product concentration, all in a simple, two-column design that eases manufacturing validation and minimizes risk of down-time while reducing operating expense. Increased productivity: The EcoPrime Twin LPLC running the CaptureSMB process delivers increased productivity (up to 3-fold) while both reducing resin costs and decreasing buffer consumption by up to 50% (or more). The risk of down-time and capital costs are minimized and operating expenses reduced when compared to other multi-column systems. GMP customers have proven the direct scale-up / scale down with ChromaCon’s Contichrom CUBE. The fluidic design of the EcoPrime Twin LPLC system allows for direct scale-up or scale-down to the Contichrom CUBE FPLC from ChromaCon. Methods developed on the CUBE can be easily transferred to the EcoPrime Twin LPLC. Intuitive software for twin-column operation: The EcoPrime Twin LPLC automation and control software is designed to be user-friendly. Operators can easily navigate and manage process setup, execution, and reporting. The software is designed to enable 21 CFR Part 11 compliance. Advanced Pumps and Fluidics: The EcoPrime Twin LPLC system uses industry leading LEWA ecodos pumps and are enhanced with an exclusive digital pump control technology providing (1) wide flow-range accuracy for improved product yield and purity and (2) industry leading precision and batch-to-batch reproducibility. To guarantee consistent and reproducible performance, the EcoPrime Twin LPLC system is designed with minimal holdup volumes and symmetric flow paths between the two columns, which was accomplished by optimal piping and components arrangements and sizing. Pump(s) with hygienic design capable to deliver industry best-in-class precise flow. Multiple inlet and outlet valves. Air sensors to protect the columns or prevent dry running conditions. All necessary tubing, valves, instruments, connections and safety devices for GMP process requirements. See what we mean. Watch our VIDEO on continuous chromatography. Watch us COMMISSION unit in <8 hours VIDEO HERE. End USER RESULTS - Paper with Scale Up data download here. New twin column chromatography system specifications and application information. 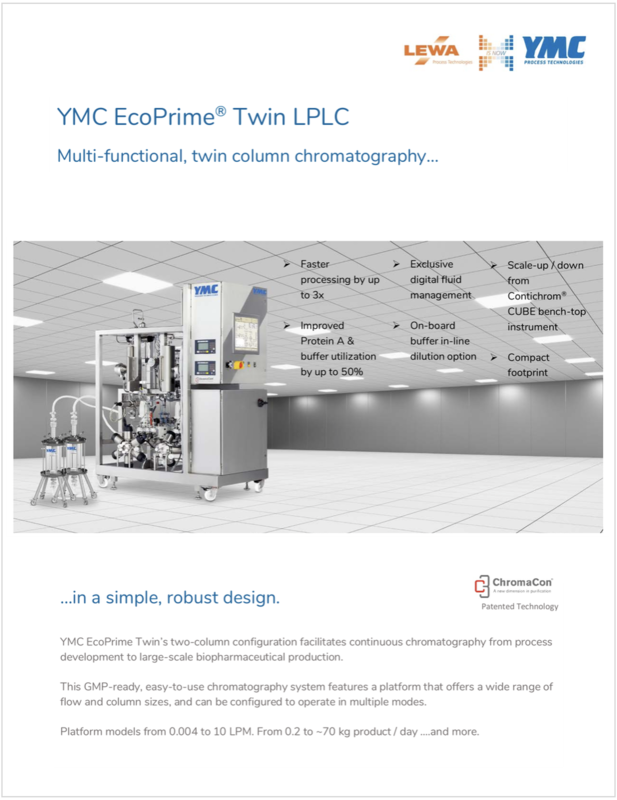 The EcoPrime Twin LPLC is a multi-column system that performs continuous, connected continuous and batch chromatography with additional option for buffer in-line dilution. Four unit operations engineered into a multi-column platform with an option for single-use technology for buffers at production scale can help achieve an early ROI and enhance productivity. Measure the benefits! 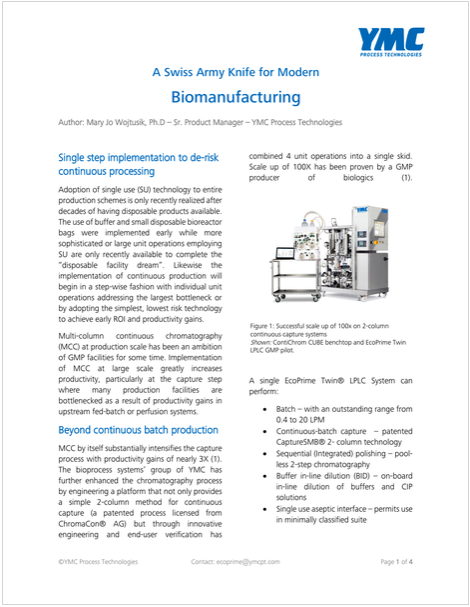 Download flexible tool to see how you can save time and money with continuous bio-processing. A walk through of the most advanced technology for the purification of theraputic molecules. Multi-column chromatography is explained in the presentation. Case studies presented.